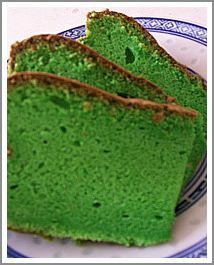 Green cake is soft and delicious cake. This cake is especially attractive for the children because of the color. You can add the green coloring in different intensity. I usually add more green color so I can make a dark green color cake, which is the favorite of my son. The coloring that I used here in the cake recipe is from pandan extract which means that this kind of coloring give more tasteful cake. You can smell the heavenly fragrance of pandan. It’s really invited you to make and taste some more. Beside of the taste, this is really easy cake to make. I can assure you that are impossible to get hard cake if you follow the instructions as I described here. So try this cake, one of the lovely and colorful Indonesian desserts. Mix together the eggs yolk and sugar until they are fluffy and creamy for about 25 minutes. In the mean time make a mix of water, oil, pandan extract, salt, baking powder and cream of tartar in a bowl. Set aside. Make also a mix of the eggs white and sugar in a separate bowl. Mix together for about 10 minutes with the mixer until you get a fluffy mixture. Set aside. Add the cake meal in the eggs yolk mixture. Stir it until the meal well mixed with the mixture. Then add the mixture of oil, water and pandan extract. Stir it gently until everything well mixed. And for the last thing, add the fluffy eggs white mixture. Stir them well and pour in the baking pan that you’ve already buttered it first and bake it in the oven for about 1 hour. After 1 hour and before you take them out of the oven, make sure that the cake is really done by inserting a sate skewer into the cake and when you take it out you haven’t a wet part on the skewer, and then is the cake really done.